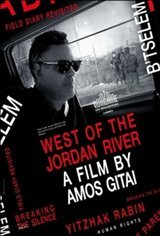 Amos Gitai (RABIN, FREE ZONE) returns to the occupied territories for the first time since his 1982 documentary FIELD DIARY. WEST OF THE JORDAN RIVER describes the efforts of citizens, Israelis and Palestinians, who are trying to overcome the consequences of occupation. Gitai's film shows the human ties woven by the military, human rights activists, journalists, mourning mothers and even Jewish settlers. Faced with the failure of politics to solve the occupation issue, these men and women rise and act in the name of their civic consciousness. This human energy is a proposal for long overdue change.